This set of 6 small roll bag emergency kits provides a selection of emergency items for warmth, rain, minor first aid and more. 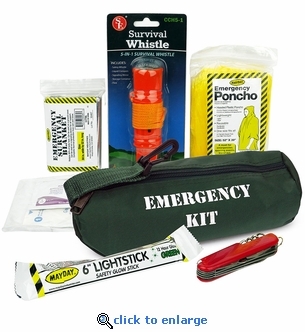 These small emergency kits are perfect for glove box, backpack, work place or vehicle. The 14-piece kit is packaged in a small zippered roll bag with strap and a clip. 1 - Emergency Solar Blanket. Total Weight: 3.75 lbs. - Each Kit Weighs 10 oz.